Radio Design is both delighted and proud to win 2 nationally prestigious awards at the ET Telecom Awards 2014, on 5th Dec at the Hotel Taj Palace, New Delhi. The ET (Economics Times) Telecom Awards recognise and honour excellence and innovation in the Indian telecoms industry. The glitzy award ceremony was attended by many top dignitaries from the Indian telecoms industry, including CXOs of leading operators, industry bodies and government and regulatory authorities. The first award “Telecom Game Changer Of The Year” was a special award presented by Shri Ravi Shankar Prasad, Honorable Minister of the Department of Telecom, to recognise a company who has come up with an event, idea or procedure in the industry that changes an existing situation or activity in a significant way. 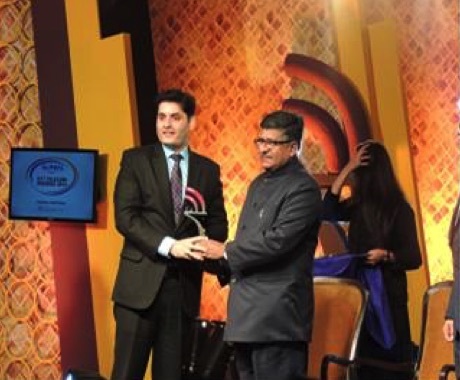 Radio Design was the proud recipient of this special award among all the telecom companies across India for the year 2014 for its innovation in the field of passive network sharing. The second award “Innovation in Developing an OEM Product” was to recognise innovation in original telecoms equipment which has resulted in expanding the customer base, increasing revenue/profitability or changing market dynamics. Radio Design was the proud recipient of this award among the final 3 nominees (Radio Design, Cisco & Celkon Mobiles) for its radio frequency (RF) filter combiners. With these products site-sharing evolves to the next level, where operators’ savings are not just limited to the cost of the tower; they can also eliminate the costs of antennas, RF feeder cables and other ancillary products as, in one compact box, all operators and their respective technologies can be combined and radiated through a single antenna and set of feeders.